NYPD and Queens District Attorney Richard Brown filed no charges against a driver who hit a 90-year-old woman last month, causing fatal injuries. The victim was struck in the 109th Precinct, which made news last year for initiating a crackdown on walking in response to a series of pedestrian deaths at the hands of motorists. 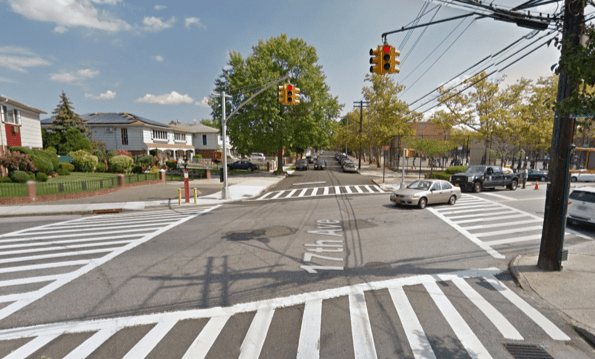 Dorothy Heimann was crossing Clintonville Street at around 9:50 a.m. on February 7 when the driver hit her with a Jeep SUV while turning left from 17th Avenue, according to NYPD and accounts published by Gothamist and Ridgewood Times. Clintonville Street at 17th Avenue, in Whitestone, is a signalized intersection of two-way residential streets. There is no exclusive turn signal, according to Google Maps photos, so if the driver had a green light, it’s likely Heimann would have been crossing with the right of way. Heimann, who lived in Whitestone, suffered head trauma. She died on March 4. The Right of Way Law gives police and prosecutors a tool to hold drivers accountable for harming pedestrians and cyclists who are following traffic rules, but NYPD and city DAs rarely use it. As is usually the case when law enforcers don’t file charges for a serious crash, NYPD withheld the name of the motorist. Gothamist reported that the driver fled the scene, but the NYPD spokesperson I talked with said she saw no indication that the crash was a hit and run. DOT crash data show that in 2015 three motor vehicle occupants were hurt in crashes at Clintonville Street at 17th Avenue and at 17th Avenue at 154th Street, which intersect a few yards to the east. Injuries to people in cars are a good indicator of collisions at high speeds. Two schools, a church, and a playground flank 17th Avenue where the 2015 crashes and the one that killed Heimann occurred. Local cops in the 109th Precinct ticketed 867 drivers for failing to yield and 738 drivers for speeding last year, according to NYPD summons data. This fatal collision occurred in the City Council district represented by Paul Vallone. To encourage Vallone to take action to improve street safety in his district and citywide, contact him at his office or on Twitter. Is this one of those cases where the pedestrian entered the crosswalk after the flashing hand began, thus absolving the driver of the murder? They really need to change that rule. Certain motorists are accustomed to bullying peds to stop or walk faster. They fail to see that its an old person that may not see them, let alone be able to react in the desired way. Drivers through out the north east think its normal to bully pedestrians this way as they have gone their entire lives without a cop so much as telling them they can’t do that. Real change is only possible when Vision Zero translates into real, not token boosts in enforcement. Sounds like a case of “They both had the right-of-way.” Amirite? I was going to toss in some sarcasm, but we have a tragic death. Condolences to the Heimann family. next question – Will DOT install a split phase to prevent the same in the future. split phases can reduce crashes at left turns on two way streets by 77%. It is time the DOT get on with installing them . This is a tragedy, and my condolences to Ms. Heimann’s family. I used to go through this intersection twice daily on my commute. It’s not so obvious from the photos, but Clintonville crosses on the bias so left-hand turns off of 17th St are less than 90 degrees. Perhaps the killer driver was going too fast to make the tighter-than-normal turn and lost control of the vehicle. Do alternate-geometry intersections like this one suffer crashes at a greater rate than expected? Who’s running for DA against “Accessory-After-The-Fact to Manslaughter” Richard Brown?